Hosting a March Madness basketball party? 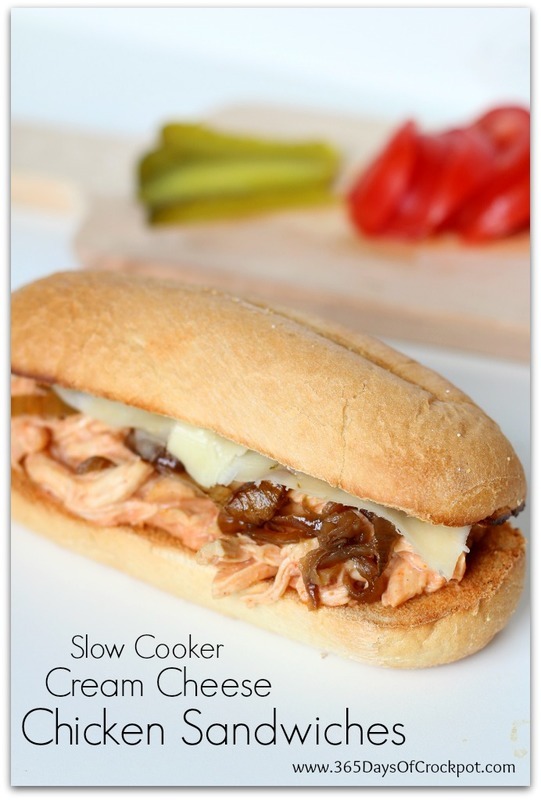 Make it easy on yourself and make these simple and delicious slow cooker cream cheese chicken sandwiches that have only 4 ingredients. 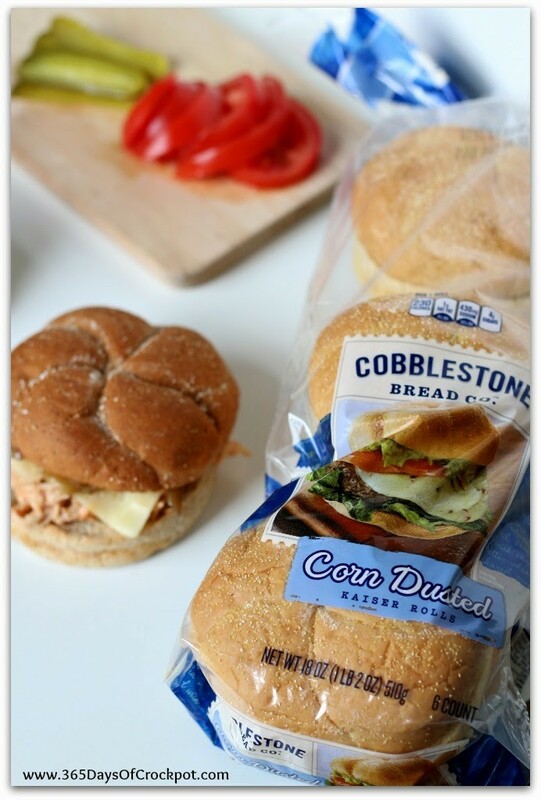 Serve the chicken up on some Cobblestone Bread Co. buns and you’re set! If you’re like my husband and I, you really look forward to this time of year. January and February are usually the long, dark and dreary months of the year with not much to look forward to. Enter March…it starts to get a little warmer and there’s the NCAA basketball tournament that is so fun to watch. We always fill out our brackets, make some good food and enjoy time watching some basketball together. 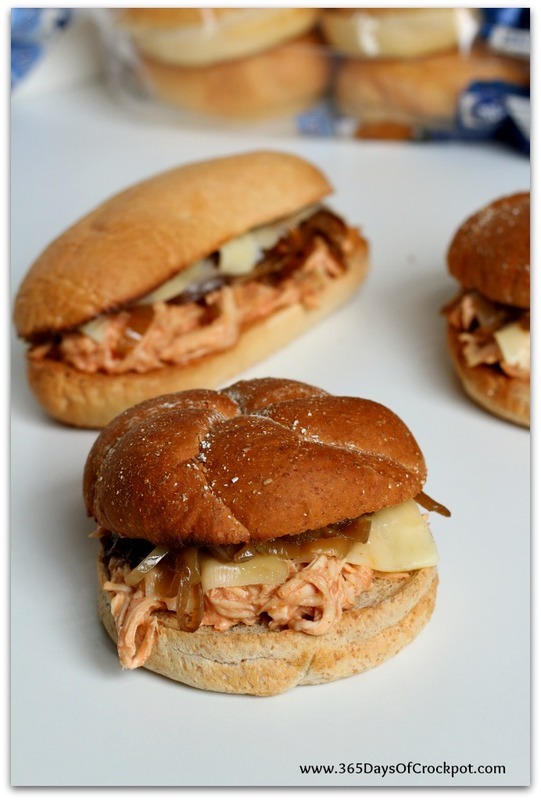 If you’re hosting a party or simply want something easy and delicious to eat for dinner why not try these Slow Cooker Cream Cheese Chicken Sandwiches? They are slightly sweet and totally addictive. I served mine with caramelized onions and a few slices of pepper jack cheese on the top of toasted Cobblestone Bread Co. buns and rolls. If you’re serving up burgers, brats or these chicken sandwiches for your basketball watching party you better make sure that you serve them up on some good bread. What’s the point of having all that delicious meat on top of gross buns? That is seriously my pet peeve. I’d rather just have the hot dog without a bun half the time. If you use Cobblestone Bread Co. products you won’t have to worry about it! Their breads are so good–like restaurant quality. I especially like their cracked wheat kaiser buns. 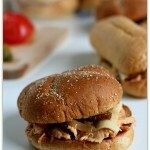 If you want to see other creative and tasty sandwich ideas for your parties check out this recipe page. The jerk turkey burger and the tex mex cowboy burger sound so good to me!! I hope our teams go far in the tournament so we have lots of reasons to make and eat new recipes 🙂 If you want to get creative with your sandwiches use the hashtag #ShareaSandwich so we can all see what you come up with! Dump in the chili sauce, apricot and cream cheese cubes into the slow cooker. Cover and cook on low for 2-4 hours, or until chicken is cooked through and tender. Remove chicken and place on a cutting board. Shred and return to the slow cooker. Stir until chicken is incorporated into the sauce. 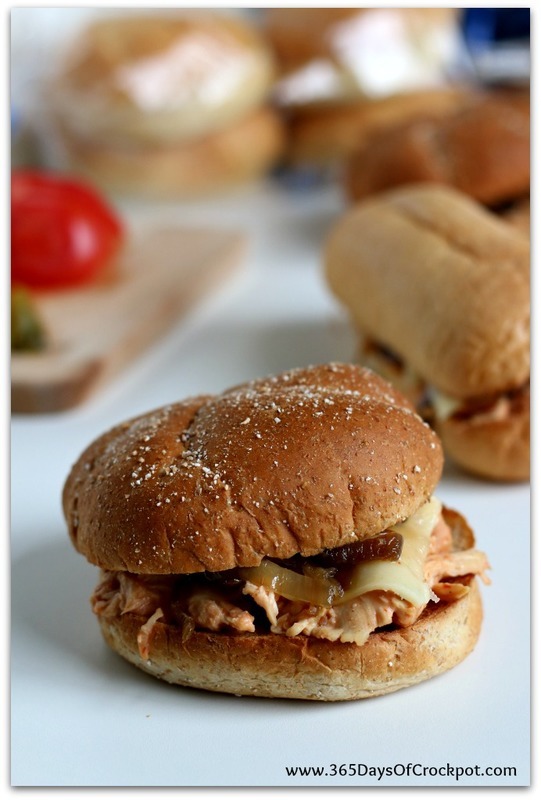 Serve chicken on top of toasted buns/rolls. Add cheese and caramelized onions to sandwiches, if desired.